So you think you are a big hot shot woodworker... but do you own a fully customized cabinet saw complete with custom paint job, and name plate? I didn't think so. 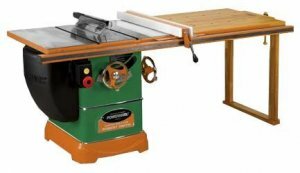 If you want to be the envy of all your woodworking buddies and own a saw that looks as good as your work, you might want to check out a custom Powermatic PM2066 Cabinet Saw. It is basically a custom upgraded version of the Powermatic PM2000. For the first time ever, you can build your Perfect Saw, and have it shipped right to your shop. This won't be just any saw. We start with the award winning Powermatic PM2000 10" table Saw. We Blanchard Grind the top, add the reliability of an American Made Baldor motor, then install your favorite accessories. You decide exactly what color it is, and we finish it off by prominently displaying your name on the front of your perfect saw. If this sounds like the perfect saw for you, check out the online Powermatic PM2066 designer for a complete list of available options. Not sure what the saw will look like in your shop? They even have a 3D miniature paper model you can customize and print out so you will be sure to get the look you want. Take a picture and show us your custom paper saws in the comments below. You can pick up a stock Powermatic PM2000 Cabinet Saw from Amazon.